It’s already over a decade since the first generation blockchain came into existence. The Bitcoin Blockchain introduced principles of decentralization, distribution, immutability and anonymity. This made it possible to conduct trustless transactions, with faster speed and less expense, not obtainable in traditional systems. Ethereum Blockchain and its smart contracts were the second generation blockchain which, while being heterogeneous, also made tokenization of assets easy. In spite of the advancements brought by both generations, there were problems of high energy consumption, slow block validation, difficulty in scaling and a host of other challenges. Some of these problems, especially that of scalability was what the third generation blockchain came to solve, by introducing Proof of Stake, off-chain routing, validation algorithms and complete or partial centralization. This, however, made no room for flexibility, nor made it possible to have a relational database capable of handling complex data structures common in corporate environments. 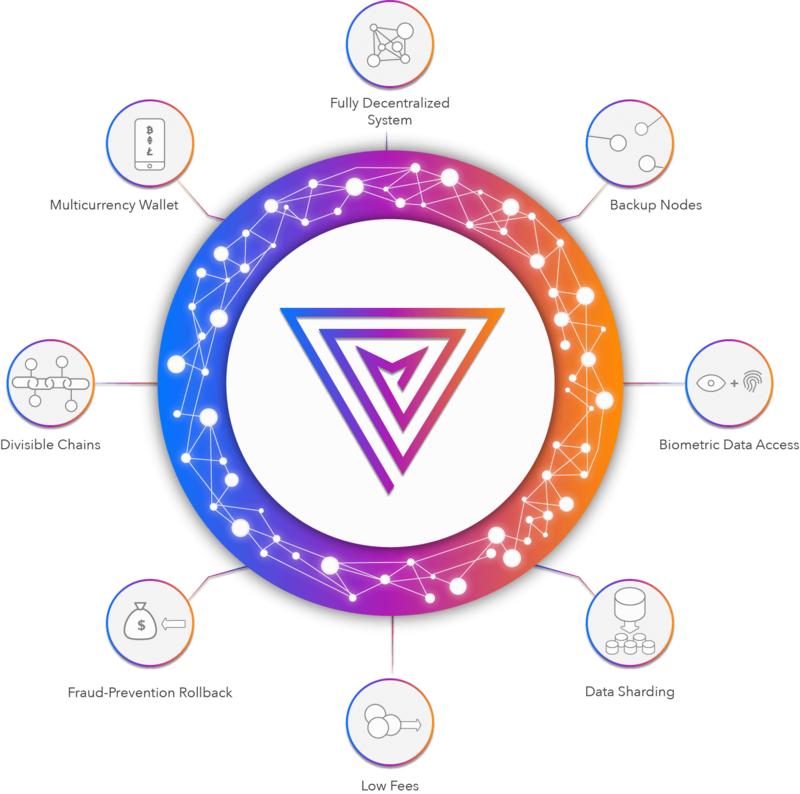 Enter the fourth generation blockchain in the form of Multiversum which is set to go far beyond the achievements and imaginations of the preceding generations. The previous generation blockchains found it difficult to expand their business operations because of the huge data they have to deal with. That’s why Multiversum has a complete primary production application and will expand current business-oriented offers in terms of data storage, application decentralization, auditing, security and reliability. The chain is brand new, built for the specific solutions it proffers and not an offshoot of an old generation’s chain. The project will be offering complex data organization instead of data sequencing, chain splitting and rejoining to allow for greater scalability and parallelism. Each transaction on this chain is done at a speed of 0.2 seconds. Faster than you can blink! This is in stark contrast to transaction speeds for Bitcoin blockchain which could be as slow as 10 minutes or, at the upper limit, one hour or even days. A database system’s speed is measured using transaction throughput, which is in turn calculated by number of transactions per second (TPS). This gives insight into the database’s performance. Multiversum’s transaction throughput is impressive at 64k TPS (1000 per core TPS). With a database of such speed, the blockchain has unlimited scalability at 64+ core technology support. Because transactions in the fourth generation relational blockchain will be computed using Proof of Integrity, there will be very low power consumption. Multiversum aims to be eco-friendly in carrying out transactions on the blockchain. Forget passphrases, think eye scans and fingerprint. That’s the level of sophistication you can expect from the fourth generation wallet. Multiversum will support biometric inputs for data and funds transfer. There will also be multicurrency support and storage in the wallet. In a bid to turn back the hands of time and avert a loss or fraud, some blockchains carry out a rollback. Depending on the particular circumstances, a rollback could actually be more expensive than letting the fraud or loss go. The Multiversum blockchain would not support rollback for coins, but it can be done for tokens. This is to preserve the immutability of the chain. Resource optimization among nodes on the network is possible because of the chain’s severability and its capability to split. Physical network nodes are located in myriad locations across the world. While this mirrors the decentralization principles, it also ensures recovery nodes are safe in the event of a global disaster. R&D Hacker Bounties have been launched to show that the project is doing what it says. If someone finds bugs and vulnerabilities in the protocols, they are offered a huge reward. The hacker bounty is to keep Multiversum on its feet in providing complete security. Rather than adopting the Proof of Work and Proof of Stake consensus (how data is validated on the blockchain), Multiversum will be using the new Proof of Integrity validation. The Multiversum blockchain will be compatible with ERC20 and ERC23 issued tokens and coins. Thus, external solutions can host on their chain, just as Multiversum solutions can host on external chains. For external confirmations, a notary is used. There will be a mobile app that lets one send multicurrency in less than one second across the world. The App will be available on both Android and iOS mobiles. Markets in public health, finance, industry, government, and private individuals who require high security and vast databases for their operations are Multiversum’s targets who would be using the blockchain to meet their needs at a trifling cost. The People – individuals, corporates, human values and the social aspect of blockchain. The Planet – protecting the environment, conserving resources, and minimizing pollution. The Profit – yes, every business must consider the profit side; if the project cannot draw in funds, then it is likely not feasible. In its ICO, Multiversum aims to raise $65 million at hard cap and $5 million at soft cap. Sale of the token will launch at a price of $1 each. One month Pre-ICO begins on March 1st and ends on March 31st, with bonuses ranging from 25% to 35% depending on the amount contributed. The two-month ICO launches on the 16th of April and ends on the 10th of June. Bonuses are offered each week ranging from 20% to 5% in descending order as the 8-week ICO progresses. You can register for crowdsale here. A total supply of 141 Multiversum Tokens (MTV) have been created. MTVs are not mined and unlike other ICOs, unsold tokens will not be burned. Rather, they would be airdropped twice every week after ICO finishes to MTV holders.